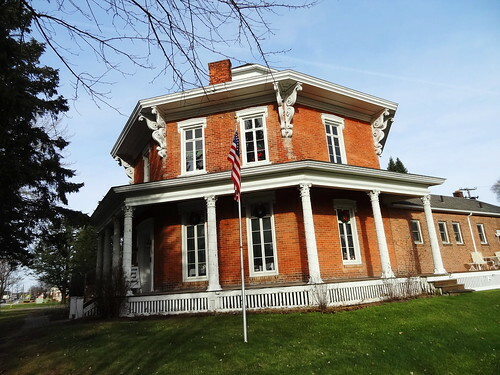 In 1860, Macomb County farmer, engineer, Loren Andrus completed construction on his cupola-topped, Corinthian-columned, eight-sided home on Van Dyke just north of 26 mile Rd in Washington Michigan; 155 years later it’s still looks beautiful. 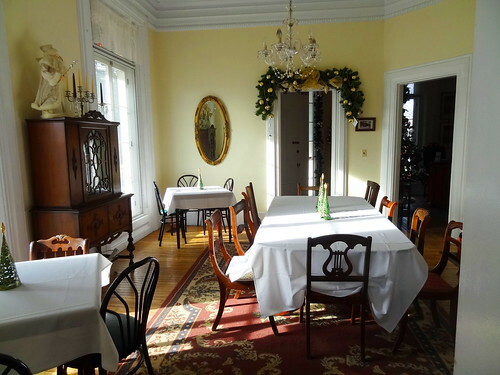 Today the Friends of the Octagon House are having a holiday open house and we’re going. 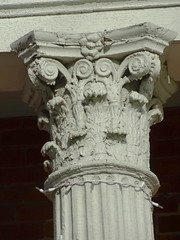 Before we start our tour, I’d like to tell you a little about this unique style of architecture. 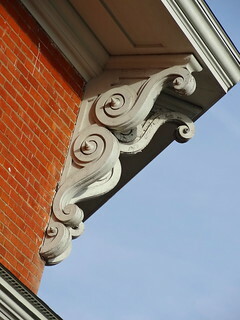 Some consider the octagon the first pure American housing style, it is completely different from the styles brought from Europe; Thomas Jefferson designed over 50 buildings with octagonal features. Eight-sided structures were less expensive to build, every inch could be used as living space, they were easier to heat in the Winter and stayed cooler in the Summer months due to the spiral staircase. It’s estimated thousands of octagonal homes were built in the US, mostly on the East Coast; today, less than 500 remain, two of them right here in Macomb County. We park in the lot next to the house, two of the original barns remain on the property, the orange brick home features 8-foot windows, white trim and pretty scrolled brackets reminding us it was built in the Victorian era. 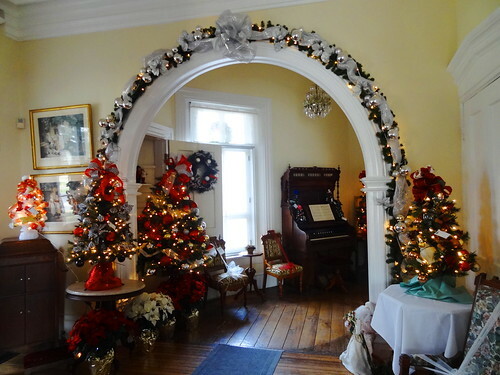 The front entrance is open, Christmas decorations fill the rooms, walls are pale yellow, wide trim pieces are painted satin white. I am astounded at how fancy the interior is; thick moldings hug wide arches that permit passage from one room to the next, ceilings are embellished with carved details, medallions act as anchors for chandeliers, and the spiral staircase……..wow!! 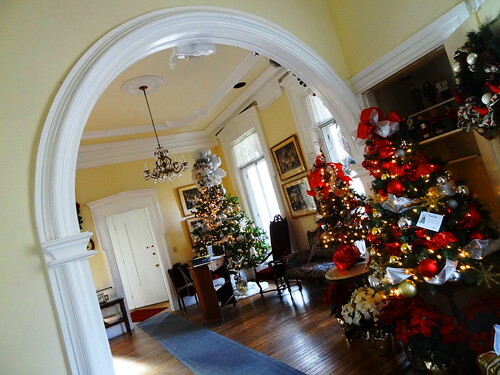 All of the decorated trees and garlands are for sale, one of the many ways the “Friends” raise funds for restoration and maintenance, it’s beautiful. Rooms flow one to the next, period furniture fills the space, many items have been donated. 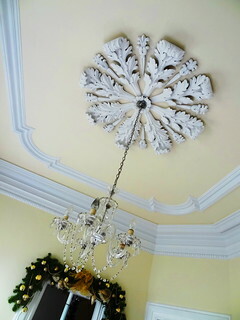 In the dining room a cluster of large plaster acanthus leaves cling to the ceiling forming an elegant medallion for the crystal chandelier, this one is original, there’s a lovely china cabinet and sideboard, light pours in through the large windows making the room bright. 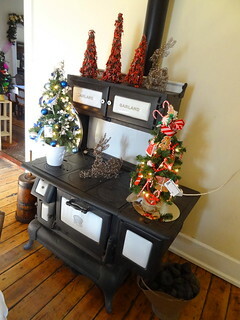 There are different rooms for entertaining on the first floor, the kitchen is complete with ice box and antique stove. 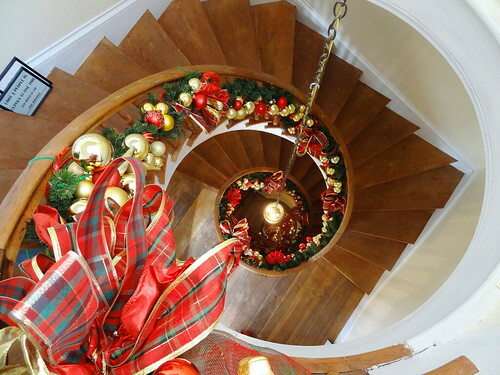 The centerpiece is, of course, the 55 step, cantilevered, spiral staircase that leads from the first floor to the third-story cupola, it’s gorgeous! 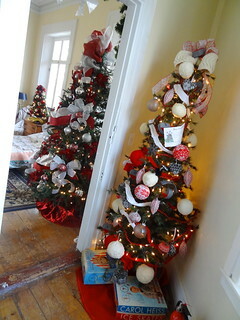 Today it’s embellished in ribbons, garlands and glass ornaments. 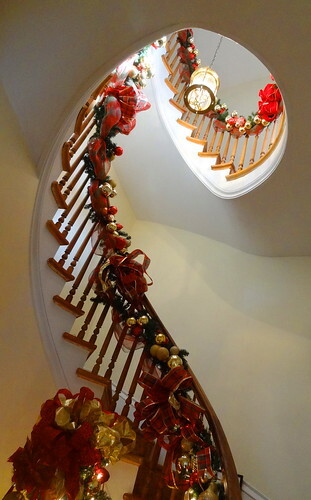 Kris and I stand at the bottom and gaze up to the top, it’s a swirl of plaster, wood and holiday sparkle. Climbing the steps, we go all the way to the top, inside the cupola we are granted a panoramic view of our surroundings; on one side mature trees and old barns recall the days when this was a working farm, the other direction, a complete contrast, busy roads and modern businesses. Walking down one flight, we are on the second story where the family bedrooms are located. 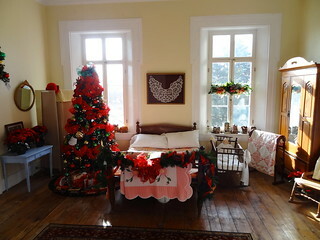 Again we have that flow from room to room; doorways are wide, floors are broad planks, beds are antique, quilts are draped on racks; Christmas trees and Poinsettia adorn the spaces. A sitting area is finished off with thick books filling cases, a phonograph and other old-fashioned items scattered throughout. We descend the dramatic staircase to the first floor, then continue on to the basement, here we find old photographs and displays. There have been ‘digs’ on the property revealing old farming tools, bottles and wheels. 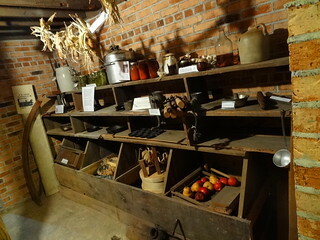 A cellar is filled with cast iron skillets, rolling pins, baking pans, butter churn and storage bins for vegetables grown on the farm. Canning jars are filled with pickled and preserved items. 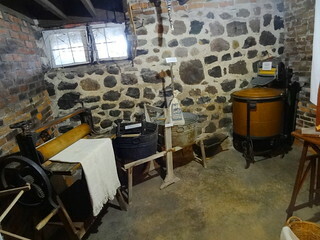 In the laundry room there’s an old washing machine and a wringer to squeeze out the excess water before things were hung on the clothesline, reminds me of what a chore laundry used to be. Did you know the Octagon House was one of the stations on the Underground Railroad? Like so many other important, historic sites and buildings, the Octagon House had been vacated, vandalized and condemned, it was rescued just days before the wrecking ball was set to demolish the house. I remember coming here as a kid when it was the Apple Barrel Farm (1974-84) complete with animals. 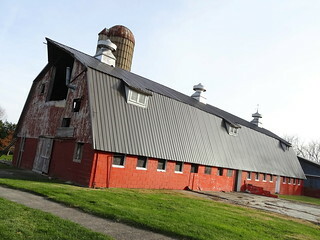 Today it is a State of Michigan Historic Site, it’s on the National Register of Historic Places and is a Macomb County Historic Landmark. 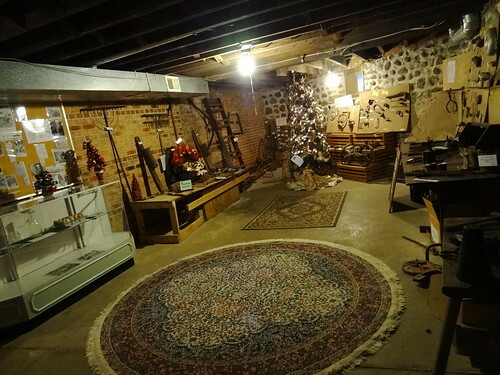 It’s really a remarkable place, I encourage you to visit during one of their open houses or events, it can even be rented out for one of your own private events; check it out. 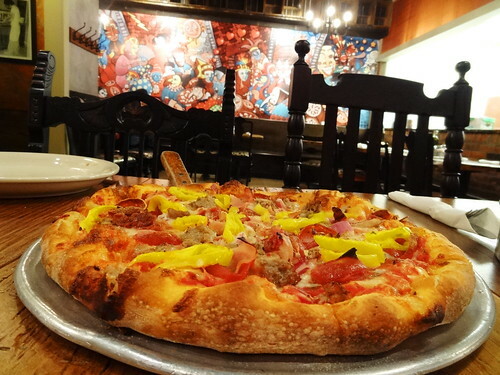 Driving south on Van Dyke, we decide to stop off and grab a bite to eat at Tivoli’s Pizzeria in Utica. Nestled in a decades-old strip mall, the building recently suffered a fire, this is our first time back since they re-opened. The inside is completely different, yet the same. The layout hasn’t changed; tables fill the front section, the open kitchen remains in the middle. The decor is a bit more rustic, chandeliers are mismatched, table tops resemble old wood planks. 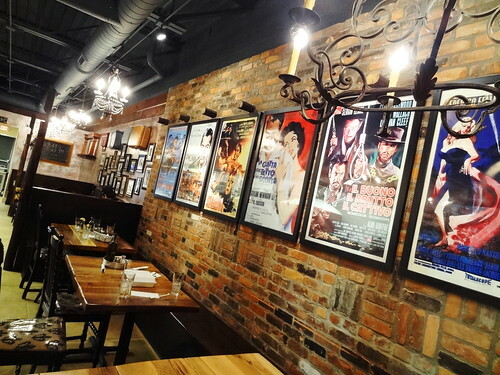 The long wall is exposed brick, Italian movie posters hang mid-way down, the left wall is covered in a custom painted mural, photographs and memorabilia belong to the family. We’re glad to see many of the old staff members have returned. The menu has been revised; new things have been added, old favorites remain (whew!). Today we are having the Tivoli Special, a NY style round pizza with mozzarella, pepperoni, mushrooms, green peppers, onions, ham, bacon, Italian sausage, we add yellow pepper rings to the mix. 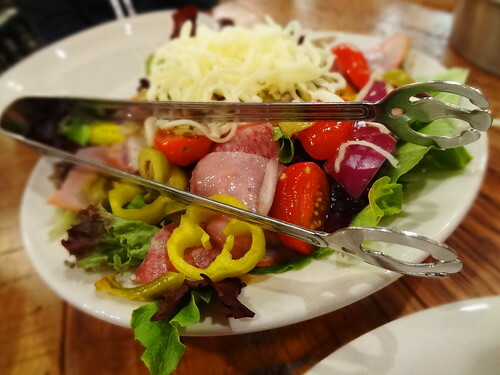 We start with the Antipasto salad, a nice pile of crisp lettuce topped with all the usual suspects, dressed with the housemade vinegar and oil, delicious. Our pizza is served right from the wood-burning oven, the crust is puffed high in some spots, melted mozzarella stretches all the way from the pan to our plates, it’s delectable, as expected. They also make Sicilian square and Chicago stuffed pizza, oh and don’t forget about dessert, you can’t go wrong with their homemade Tiramisu or Cannoli.